Taste Washington bills itself as the nation’s largest single region wine and food gathering. This year it was bigger and better than ever. Bigger — two days instead of one — with 225 wineries (out of the roughly 700 in the state) pouring about a thousand different wines. 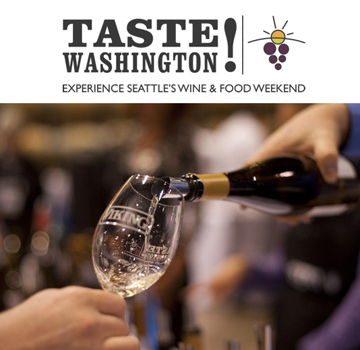 A great opportunity to survey Washington wine and taste food from more than 60 local restaurants. The program was also better in a way that will make sense to Wine Economist readers. It seems to me that the Washington Wine Commission made even more of a point to help and encourage participating wineries to tell their stories and to promote their products. The pre-event messages were more focused and the two-day format meant that the wineries could give attendees more personal attention, which is key to relationship-building. This has always been the goal, of course, but I sensed an even more clearly directed effort this year, which I applaud, and I hope it pays off. My first exposure to Taste Washington put me on the other side of the tasting table, pouring the wines of Fielding Hills Winery for my good friends Mike and Karen Wade. Although I wasn’t able to taste many other wines, I think I had the best view of the event because the people came to me — and it is meeting and talking with the people that is probably the best part (no offense to the food and wine). So how do you actually taste Washington? You can roam around randomly, sniffing and swirling, but I think it is best to have a strategy. Last time around I tried to taste every Washington Malbec I could find to compare with the Argentinean wines I had tasted in Mendoza. Fascinating! This year I decided to try to see Washington wine by imagining that I was new to the region but far from new to wine and looking at the state’s industry through these particular eyes. My imaginary guides? David Schildknecht and Benjamin Lewin. They weren’t there to guide my in person, but I used their recent writings to steer my path. Here’s what I think I learned. David Schildknecht is The Wine Advocate’s new reviewer for Washington State, replacing Dr. Jay Miller who has moved on to other pursuits. Schildknecht has written for Robert Parker’s celebrated wine journal since 1989 and I have especially appreciated his reviews of German and Austrian wines. He made two visits to Washington in 2012, literally starting from the ground up to master his new turf by touring the vineyards in the company of geologists! 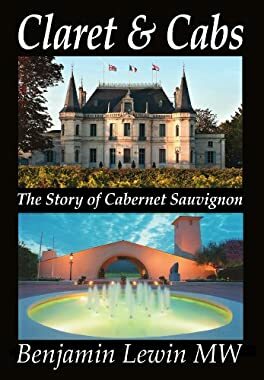 Benjamin Lewin visited Washington in September 2012 to gather information for his forthcoming book Claret & Cabs: The Story of Cabernet Sauvignon, the sequel to In Search of Pinot Noir. Lewin’s Washington stop was part of his project to taste Cabernet Sauvignon and Claret (or Cab blend wines) from all the most important wine regions of the world. Lewin is nothing if not ambitious and the resulting book is quite spectacular. I admire Lewin’s sharp analytical approach and his fluid writing style and I frankly envy his skill as a wine taster. Look for a review of Claret & Cabs closer to the May 1, 2013 official publication date. I decided to make Schildknecht and Lewin my guides since they were both essentially experiencing Washington for the first time and because their backgrounds and approaches are so different. Surely I would get an interesting view by putting Lewin’s lens in front of one eye and Schildknecht’s in front of the other. I know what Lewin thinks because I’ve got a review copy of the book. Schildknecht’s views are not yet fully stated [and perhaps never will be — see note below — because a new reviewer was assigned to Washington on the day this post was published]. Wine Advocate has only published a selection of his reviews of individual Washington wines and wineries — an additional tranche of reviews has been promised for some time, but hasn’t yet appeared. Included in the so-far unpublished list are wineries that account for a majority of Washington wines — Chateau Ste Michelle, for example, Columbia Crest and many others. I don’t think we will really know Schildknecht’s views until all the reviews have been released and even then it might take a few years to see how the pieces fit together. Fortunately, he has published an essay that tries to sum up his reaction to Washington and its wines and I have found that very useful (it is behind the sturdy Wine Advocate pay wall, however, so you’ll need to purchase a subscription to read it). Lewin and Schildknecht both seem to be confused or perhaps appalled by Washington’s untidy ad hoc system of AVAs, so they mainly ignore them and focus on vineyards and wineries rather than regional designations. They both address the issue, which I raised last week, of a signature varietal. And while the Washington industry is officially neutral in this fight (we’ve tried signature varietals before and the results haven’t been pretty), Lewin and Schildknecht don’t hesitate to state their choices. Washington is all about Cabernet and Merlot says Lewin (who coincidentally is writing a book about Cabernet and Merlot), although he seems to think that adding Syrah to the blend can be a good thing. It’s all about Cabernet and Syrah, says Schildknecht, although you can tell that he really wishes that he could make a stronger case for Riesling. The problem with Washington Riesling, according to Schildknecht, is that Washington can make extremely good wines at affordable prices. You can get maybe 80-90% of the quality of top German wines for a low price (my numbers not his), so who is going to pay the substantial extra cost to get that last 10%? No one, he moans. So Washington Riesling is doomed to arrested development. Schildknecht also seems concerned with the division of labor in Washington wine, where wine growing is one specialization and wine making and marketing another. Most of the world’s great wine is estate wine, he says, where the two functions take place under unified control. The Washington non-estate practice of blending from different sites and different appellations to add complexity and diversity feels like a compromise to him, even when the results are very good. Lewin is more concerned about clones. He notes that a great many of the Cabernet vines are the same or similar clones, especially the earlier plantings, so that clonal diversity is very limited in making the wine, meaning that cross-region blending is needed to add complexity to the wines. I have no compunction about drawing analogies to specific Old World wine types when I think these apply – and for the benefit of those (very much including yours truly) for whom these are the most familiar points of reference. But virtually all of the most exciting wines I tasted for the present report display personalities and styles whose like I haven’t encountered outside Washington, and that is precisely what their producers and promoters should wish for. Lewin locates some of this distinctiveness in his comparison of Cabernet and Merlot. Usually, he notes, you add Cabernet to Merlot to give it depth and structure. In Washington, on the other hand, it is Merlot that is the gutsier grape and Cabernet that perhaps needs a little punching up. Maybe this is due to Washington’s distinctive growing climate (large diurnal variation, longer sun-filled days) and perhaps this accounts for Washington Merlot’s signal success in the pre-Sideways Merlot boom days. Both authors seem to wonder why Syrah isn’t more often included in Cabernet blends? Is the idea that Washington winemakers must adhere to “Bordeaux blend” orthodoxy preventing them from making the best and most interesting possible wines? Lewin and Schildknecht are very interesting on their own and you can perhaps see that piecing them together raises some questions and starts to answer questions, too. What did I learn with the two of them as my imaginary guides to Taste Washington? Come back next week to find out. Thanks to the Wine Appreciation Guild for letting me have a sneak peak at Benjamin Lewin’s new book. I’ll post a full review in a few weeks. Res Syrah. I noticed that the 09 Waterbrook Melange Noir lists Syrah as the first of the blend followed by Sangiovese and only then Merlot and Cab. IIRC back in the old days (Melange, only red) Cab and Merlot were the first two. I am still grumpy about the new heavier bottle. My limited judgement is that it does not stand out as much from other value Washington blends is it did 15(?) years ago.